Middle East newspapers are horrified by the fall of Iraq's second largest city, Mosul, to the jihadist Islamic State in Iraq and the Levant (ISIS), known pejoratively in Arabic as "Daesh". Some commentators believe that if nothing is done Iraq may be destroyed, with serious consequences for the region. One Iraqi writer is interested in why Mosul was not better defended, while a Saudi paper wonders if there is not a more sinister conclusion to be drawn from the Iraqi army's withdrawal from the fight to defend the city. "Mourning Iraq, mourning Mosul, mourning Falluja, mourning Samarra, and mourning all the other Iraqi cities which will fall to the ISIS, one after the other... Saddam Hussein and the Baath Party destroyed Iraq and left it as only a half state. Political Islam is now destroying the other remaining half of the state." "What really happened? Why was the road so clear for all these mercenaries to march in?... How did the group reach the outskirts of the city, then its very heart, without having been at least intercepted by the armed forces? Why was air power not used to deter or to paralyse them, if not to eliminate them altogether?" "The Iraqi prime minister's endeavours to cling to power at any cost are nothing new... For his top commanders to flee the clashes and to refrain from protecting civilians in Mosul suggests two things: restlessness, or a desire to shuffle the cards - which is far worse. 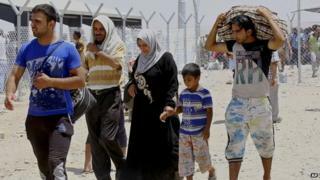 Paving the way for ISIS to establish control over the Sunni city of Mosul arouses suspicion." "The state is crumbling in western Iraq and Iraqi cities in Sunni provinces are falling one after the other... As for us in Jordan, we no longer have the luxury of wait and see, because the danger is approaching our bedrooms." "Daesh has united its Syrian and Iraqi territories and cancelled international boundaries... Bringing it under control will require the kind of effort that the US was unable to undertake in Afghanistan." "Daesh's movement in Iraq is the growth of the cancer of terrorism in that country; and Iraqi leaders, including Shia, Sunni and Kurdish, should quickly take measures to eradicate it. Otherwise, this cancer will swallow the whole of Iraq and even the region". "With bloody extreme-Islamist developments sweeping Syria, Iraq, Yemen, Libya, Egypt, Tunisia and other countries, the Arab street, the elite in particular, and intellectuals across the world are now convinced that Arabs will have no stability while the Saudi royal family exists." "Daesh and its actions in the Iraqi province of Nineveh should be a lesson to everyone around the world. This was the result of Shia oppression supported by Iran, which triggered the anger of the Sunni minority". "The ISIS threat and the probability of an expansionist Salafist state reaching from Syria to Iraq require Turkey to reconsider its strategic priorities. And unexpectedly, Ankara finds itself on the same side against al-Qaeda as Iraqi Kurdish leader Massoud Barzani, the Kurdistan Workers' Party (PKK) in Turkey, the Kurdish Democratic Union Party (PYD) in Syria and Iraqi Prime Minister Nouri Maliki, whom it does not like at all." "One should not underestimate ISIS. It could be a strategic mistake to characterise it as a marginal terrorist organization in the al-Qaeda category". "Despite the loud noise they make about the fight against terrorism, US and European governments not only meet Daesh terrorists, but they provide them with weapons and financial support... When the US and European governments fail to adopt a position on all these terrorist crimes committed in Iraq, it clearly shows that they support the terrorists and Daesh is their tool."